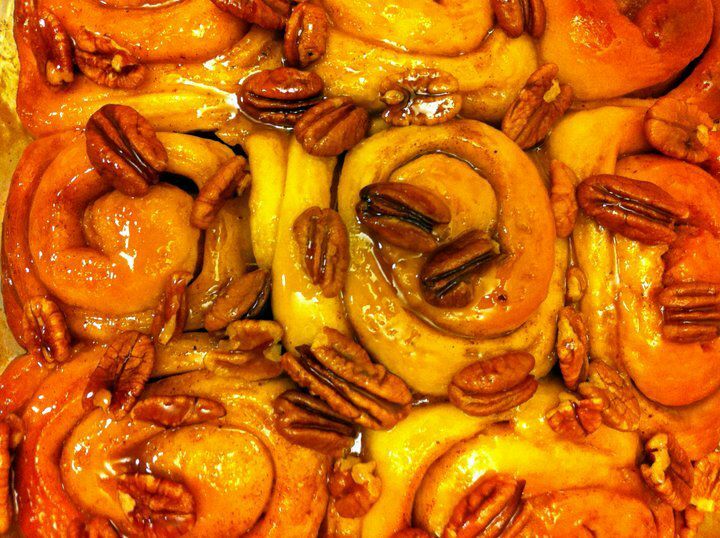 sticky buns would be dashed, and the rolls would cook up into hard little rocks. greedily scraping the pan long after the last rolls are gone. Heat milk in a small saucepan over medium heat or in a microwave until an instant-read thermometer registers 110°F–115°F. Transfer milk to a 2-cup measuring cup; stir in 1 Tbsp. sugar. Sprinkle yeast over milk and whisk to blend. Let sit until yeast is foamy, about 5 minutes. Add eggs; whisk until smooth. Can be made 1 day ahead. Cover with plastic; chill. cups nuts aside for buns. cup toasted pecans over bottom of baking pan and let cool. of oven; preheat to 350°F. Whisk egg with 1/2 teaspoon water in a small bowl. glaze over. Sprinkle 1/2 cup pecans over. Let cool in pan on a wire rack. salt over. Serve buns warm or at room temperature. them evenly apart (buns should not touch each other). Next: Next post: P.B. Brownies the most decadent dessert in my arsenal!